MK Martins pull type snowblowers connect to your tractors 3PH. The hitch facing design allows you to drive straight forward pulling the hitch instead of backing it into the snow. This means you no longer have to keep looking over your shoulder when blowing snow or drive into a cloud of blown snow. Since the blower follows the tractors path guiding it around objects is easy. Cutting Width 60" 68" 78" 87" 97"
Chute Diam. 8" 10" 10" 12" 12"
Double Hood Deflector N/A Std. Std. Std. Std. 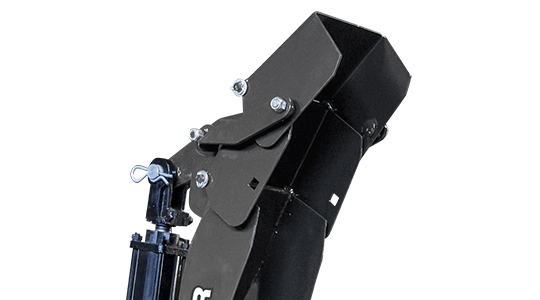 Main Body Height 25" 25" 28" 32-1/2" 32-1/2"
Chute Deflector (Man/Hyd) Std./Opt. 6" cyl. Std./Opt. 6" cyl. Std./Opt. 8" cyl. Std./Opt. 8" cyl. Std./Opt. 8" cyl. Fan Diam. 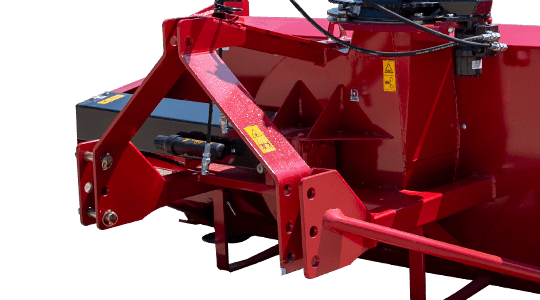 18 21" 23" 27" 27"
Fan Depth 4.5 7" 8" 10" 10"
Auger Drive Shaft Size 1 1 1/4" 1 1/4" 1 1/4" 1 1/4"
All single auger PTO driven models are built for Category 1 or Category 2 type 3PH. 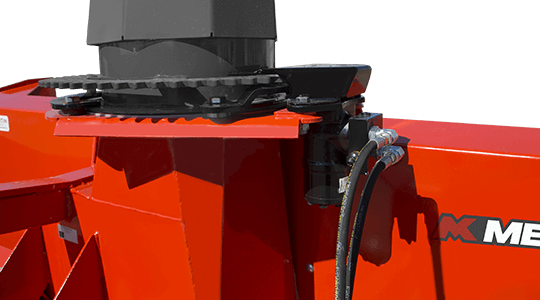 Dual auger PTO driven models are built for Category 2 or Category 3 type 3PH. All models are Quick Attach compatible. 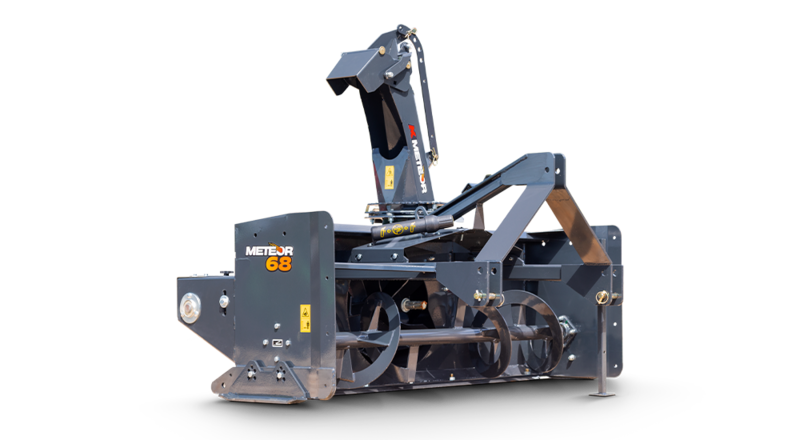 To deliver even the heaviest wet snow to the awaiting fan, Meteor Snow Blowers use machine formed hand welded augers made with high tensile steel ribbon flighting to provide strength and durability for years to come. All Meteor Snow Blowers now feature a standard 5 blade fan. 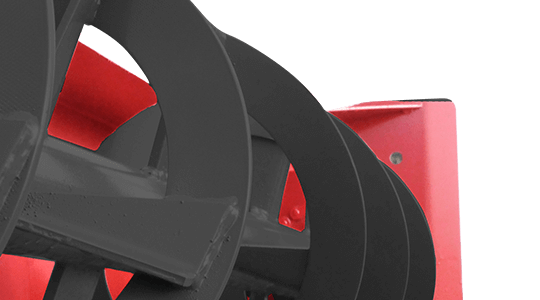 The five blades not only evacuate high volumes of snow quickly, but also feature tighter tolerance to the housing increasing velocity of the snow exiting the chute. 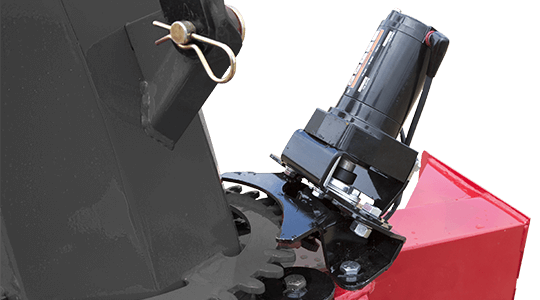 The time-proven Comer gearbox transfers PTO power from the tractor into the driveline of the Meteor. 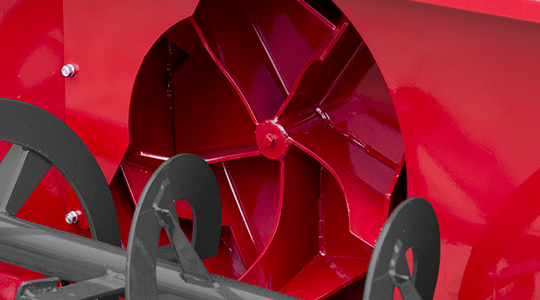 Ensuring consistent power input to the auger and fan assemblies. 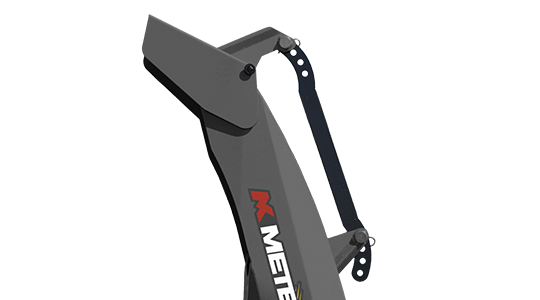 All Meteor Snow Blowers come with a manual pin style deflector allowing a true set it and forget approach to blowing snow. 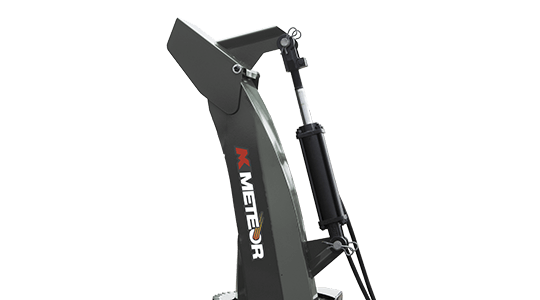 Meteor Snow Blowers come equipped with adjustable skid shoes extending the life of the cutting edge and helping to protect surfaces from damage commonly associated with snow removal. 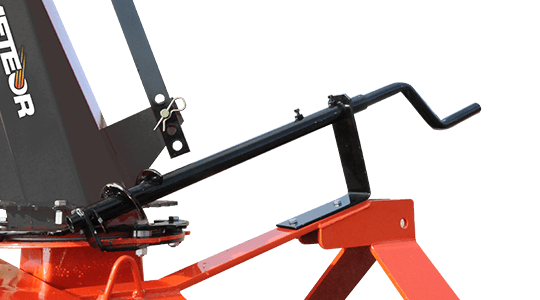 Manual rotators are standard on SB48, SB54, and SB60 single auger models and can be optionally outfitted on most models where operators can safely reach the adjustment handle. 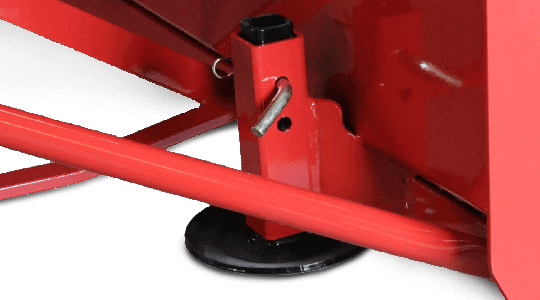 The optional hydraulic rotator is the ideal upgrade for tractors with cabs or for contractors/property managers needing to make frequent adjustments. Hydraulic rotators are standard equipment on SB97D, SB108D, and SB120D models. 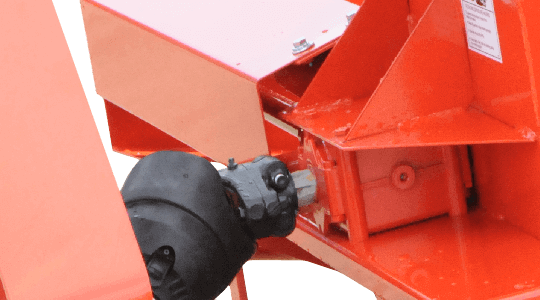 When hydraulic power isn't available the 12V electric rotator provides a hands off approach to chute rotation. Contact MK Martin for compatibility and availability. Hydraulic deflectors control the distance and arc of the thrown snow and are an available option on all models. 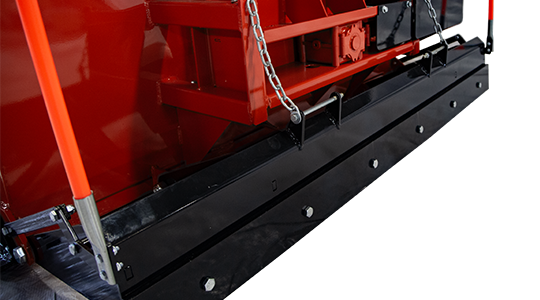 The optional multi-hinged deflector is available for most models and allows increased precision in where snow is blown allowing snow to be placed closer to the blower or into a truck to be hauled away. Available in Manual or Hydraulic. 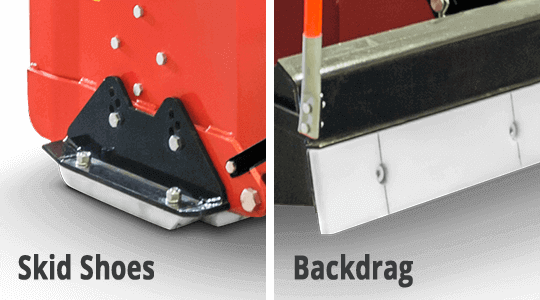 Protects surfaces against cosmetic damage from steel skid shoes and cutting edges.